In the recent news is a story about a man who died after being gored by a mountain goat in the Olympic National Park in Washington. This tragedy emphasizes something Friends of Scotchman Peaks Wilderness have become increasingly concerned about in the past year: the socialization of the goats on Scotchman Peak. We have had as our “spokesgoat” for several years, “Monte,” a male goat who frequents the peak. He is a big, healthy animal. He is beautiful. He appears quite willing to pose for portraits at close range. He has a fondness for salt including snacks, sweat and urine. Like many goats, he appears friendly. He even seems to be curious and wants companionship, much like a pet might. But he is not a pet and should not be allowed to lose what fear he has of humans. Do not encourage his closeness. It is very important to remember that while he may not be timid this does not mean that he is tame. He is a wild animal. Humans tend to anthropomorphize animals we come into contact with; in other words, give them human attributes. FSPW has given Monte a voice, via which we deliver part of our message advocating wilderness designation for Monte’s home and the surrounding roadless area. However, we also urge you to respect his wild nature, as well as that of the other goats which live near the top of Scotchman and of all animals which live in the Scotchmans. They are wild animals and should be treated with care and caution and viewed from a distance. The goat responsible for the death of Robert Boardman in Olympic National Park approached him while he was eating lunch and subsequently gored him. The animal was hunted down and killed shortly thereafter. The death of Boardman and the death of the goat very possibly resulted from the fact that the goat associated humans with food, and was socialized enough to insist that it be fed. Certainly, the goat had lost his natural fear of humans. When you climb Scotchman and encounter Monte or one of his kin, keep your distance. And make sure he keeps his from you. Do not encourage him to come closer to you, follow you or to “hang around” you. If a goat approaches you, practice some “goat aversion therapy” by “shoo-ing” him away. It may be the best thing for his long term survival. Make noise, wave hands and arms, toss pebbles. If it won’t immediately back down, then you back away yourself and move out of the area, even if it means you can’t make the summit. Do not challenge any animal for the right of passage on any trail. In the case of many animals curiosity is often driven by an interest in food and/or salt. Do not feed them anything. Keep a clean camp and lunch spot. Leave no trace. Do not urinate on, or immediately near the trail. This attracts animals. We are about to launch an “Ask Mr. Scotchman” page on this site which will allow folks to ask our mascot questions about the Scotchman Peaks in general. One of his continuing themes will be that he is an animal that needs space, not snacks, and also acknowledges that he and his family are helpless to resist human food. Visitors to Monte’s home must remember that we and the goats are endangered by us feeding them, and that, as docile as they appear, they are not part of a petting zoo. They are wild animals, and as such, are unpredictable and potentially dangerous. Please. 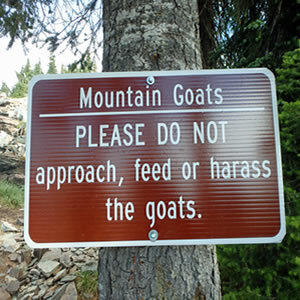 Keep your distance from the goats. What a sad thing to happen, but thank you for reminding us that “timid is not tame”…..it’s a very easy mistake to make, and very tempting to feed animals that appear to be friendly. Every now and then Mother Nature reminds us that the wilderness is not a petting zoo.